Remember the scene from 1993's "THE BODYGUARD," where Whitney Houston appeared on stage at a crowded dance club and almost caused a riot, before Kevin Costner carried her off to safety? That scene was shot at the Mayan Theatre, a nightclub located at 1038 Hill Street, in downtown Los Angeles (right across the street from the TransAmerica tower). In the exciting climax to 1993's "IN THE LINE OF FIRE," Secret Service agent Clint Eastwood tries to stop an assassin (played by John Malkovich) from killing the President at a Los Angeles hotel; Clint ends up trapped with the assassin in a glass elevator going up the side of the futuristic hotel. Those scenes were shot at the Bonaventure Hotel (404 S. Figueroa Street) in downtown L.A. The hotel has appeared in a number of other movies, including 1995's "NICK OF TIME," 1983's "BLUE THUNDER" and 1988's "RAINMAN," to name but a few, as well as the TV series "It's a Living." In 1993's "RISING SUN," while investigating a murder case, Sean Connery and Wesley Snipes visit the headquarters of Hamaguri, a futuristic, hi-tech research lab, which they believe may have altered an incriminating video disk. These scenes were actually shot in the San Fernando Valley, at The Japanese Garden in Van Nuys, CA. The "lab" and garden are actually part of the Donald Tillman water reclamation plant (at 6100 Woodley Avenue). Tours of the garden are available to the public. Remember the fight scene in the restaurant between Ike and Tina Turner in the 1993 movie "WHAT'S LOVE GOT TO DO WITH IT?." Well, that scene was shot at a modest little diner in the city of Downey, called Johnie's Broiler, which has been featured in a surprising number of recent movies. In Robert Altman's 1994 film, "SHORT CUTS," Lily Tomlin played a waitress who worked at the same Johnie's Broiler. This Downey café was also the scene of the 1995 Diane Keaton film, "UNSTRUNG HEROES," starring Michael ("Kramer") Richards & Andie MacDowell, as well as for 1994's "REALITY BITES" (starring Winona Ryder & Ethan Hawke). In 1999, the diner posed as a bus station for an episode of TV's "The X-Files." In 2000, it appeared as itself in the romance "BOUNCE" (with Gwyneth Paltrow & Ben Affleck). 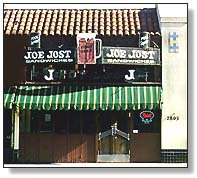 Johnie's Broiler was located at 7447 Firestone Blvd, in Downey. However, the restaurant closed, and re-opened as a used car lot! Despite that, the city of Downey refused to issue a permit allowing the demolition of the historic diner. But in January of 2007, the new owners tore most of it down anyway, amid cries of foul play from outraged preservationists. But there's good news. 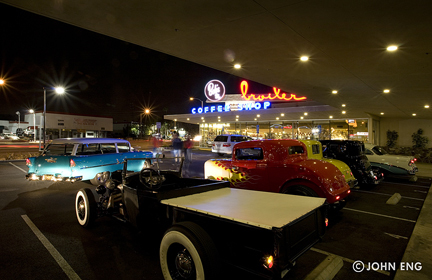 In 2009, the property was acquired by Bob's Big Boy, who rebuilt the diner, using the diner's original 1958 plans and some of the materials salvaged from Johnie's, so the new Bob's Big Boy closely resembles the original Googie-style restaurant. It even has its own website, at bobsbigboybroiler.com. And they are once again using it as a filming location, for productions such as "Mad Men".